Caught In The Act | Yobot Inc.
My good friend Shalyn got us a lovely housewarming present – a squirrel-proof bird feeder for our yard, along with a supply of bird food. We put it on a shepherd’s hook to further prevent squirrel-thiefs. 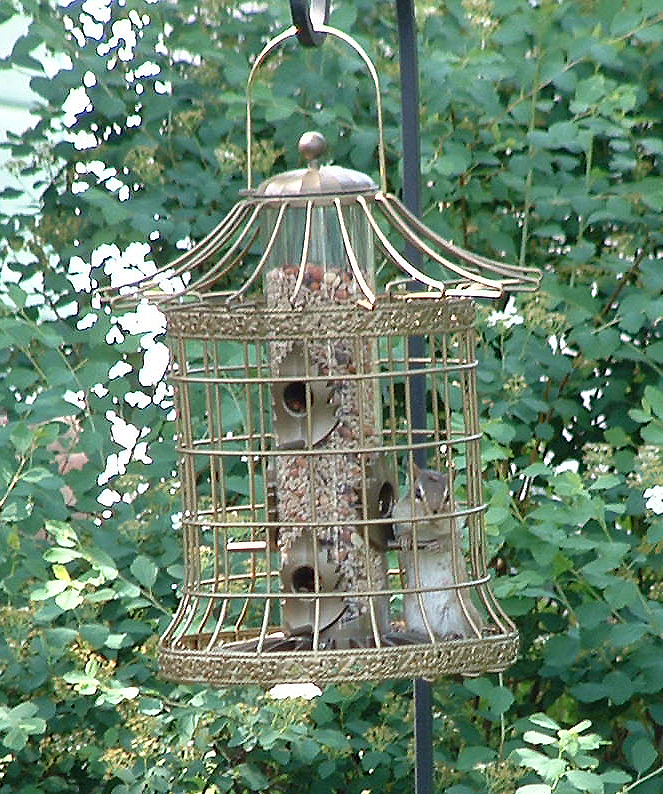 I guess it’s not chipmunk-proof. Click on the picture to look more closely at him. He looks so self-satisfied. I watched him scale the pole like he was a circus performer, and then just crawl right in the cage, giggling the whole time. Ok well let me just say that this is a travesty of epic proportions. While my dear friend Pamela is, at least for now, a fan of ALL her backyard creatures – this security breech can not be permitted! Perhaps some gluey material applied to the pole will prevent the rodent from reaching the holy grail. If that doesn’t work then I suggest a barbed wire wrap (spray painted black of course befitting the wrought iron motife). If all else fails, target practice may be in order. He looks very smug, doesn’t he? I don’t care what anyone says, it is a rat with a bushy tail. I could send FiFi for a weekend and your yard would be a squirrel-free zone!